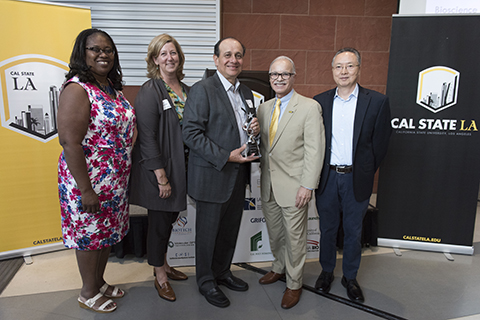 Willie Zuniga, president of Grifols Biologicals Inc., was honored for his contributions to the regional bioscience industry during a Cal State LA BioSpace ceremony celebrating emerging entrepreneurs. Zuniga is a Cal State LA alumnus who was raised in El Sereno. 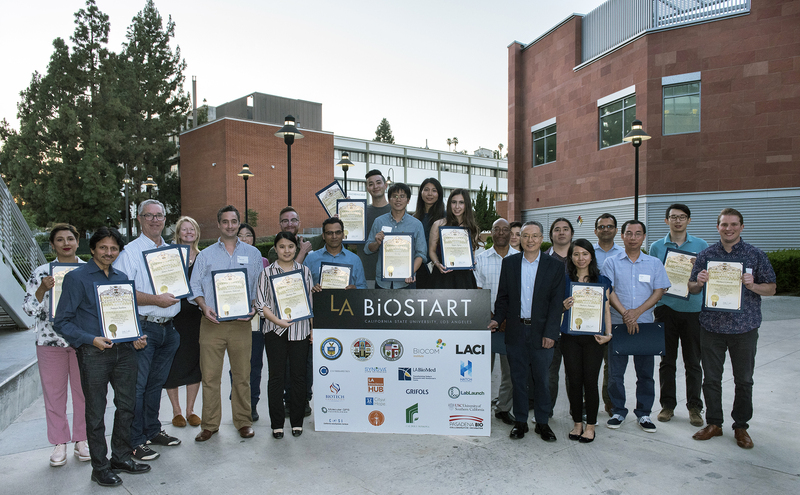 He was awarded the LA BioStar Award during the August 14 graduation ceremony for participants of Cal State LA BioStart, an intensive training program for early-stage bioscience entrepreneurs. The project is part of Cal State LA BioSpace, which is leading the university’s efforts to promote a thriving bioscience ecosystem on the Eastside of Los Angeles and in the San Gabriel Valley. During the graduation ceremony, 23 emerging entrepreneurs were recognized for completing five weeks of training in business fundamentals, financing models, industrial research and development and other tools essential to starting and sustaining successful bioscience ventures. “Through such programs as Cal State LA BioStart, which is part of the Cal State LA BioSpace initiative, we engage and serve our surrounding communities and beyond,” President William A. Covino said to the crowd gathered in La Kretz Hall. The training is a collaborative project of Cal State LA, the Biocom Institute and the Los Angeles Cleantech Incubator. The project is supported by the U.S. Economic Development Administration and is offered at no cost to eligible participants. Zuniga, a member of the Cal State LA President’s Council, attended nearby Wilson High School. Under his leadership, Grifols has been collaborating with Cal State LA BioSpace to introduce local high students to the bioscience industry and opportunities for careers in the field. The Grifols Summer Science Academy at Cal State LA has trained nearly 80 high school students in microbiology, chemistry and molecular work. The academy has operated for the past three years and allows students to work in university laboratories under the guidance of Grifols professionals and Cal State LA faculty members. “The academy sparks enthusiasm for laboratory research. These young scientists will one day develop life-changing scientific discoveries,” said Jose A. Gomez, chair of Cal State LA BioSpace and executive vice president for the university. Grifols employs more than 100 Cal State LA alumni and students out of the 1,200 people who work at the firm’s Los Angeles site, located across the street from the university on Valley Boulevard. Cal State LA BioSpace is supported by grants from Los Angeles County and the U.S. Economic Development Administration. The initiative is also supported by the Los Angeles County Economic Development Corporation, the Los Angeles County Board of Supervisors, the Pasadena Bio Collaborative Incubator, LA Bioscience Hub and the California State University. The goal of Cal State LA BioSpace is to promote cutting-edge research and entrepreneurship and support the region’s burgeoning bioscience industry, including the area known as “Bioscience Valley.” This area extends along Valley Boulevard and includes Cal State LA and Grifols Biologicals Inc. on the east, and the University of Southern California Health Sciences campus on the west. Construction is now underway at the university on the Rongxiang Xu Bioscience Innovation Center, a 20,000-square-foot facility scheduled to open in early 2019. The center will house the Cal State LA BioSpace incubator, which will feature competitively priced laboratory space, equipment and conference rooms to help bioscience startups turn scientific advances into job-creating ventures. The center will also house the Cal State LA BioStart training program. 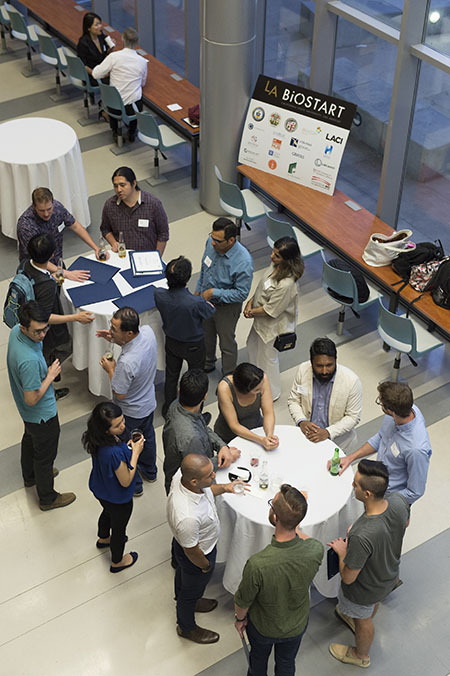 Since its launch in 2017, Cal State LA BioStart has trained more than 40 emerging entrepreneurs under the direction of Cal State LA Microbiology Professor Howard Xu, who also oversees incubator development and programming for the university. Xu was the emcee at the La Kretz Hall graduation ceremony. Cal State LA biology graduate student Jordan Molina was one of the graduating participants honored at the ceremony. He is working to develop herbs found in traditional medical practices into safe, affordable and clinically supported preventative treatments for chronic and acute inflammatory conditions, such as Parkinson’s and Alzheimer’s diseases.